There are to be no OverPowered characters (OP characters), such as characters having every single ability or being able to know every single thing. There are to be no Cannon characters, aka characters directly from the anime/manga or directly related to any of the anime/manga characters. You can also have characters that look like the cannon ones, but don't make them have the same exact personality and history as the cannon. 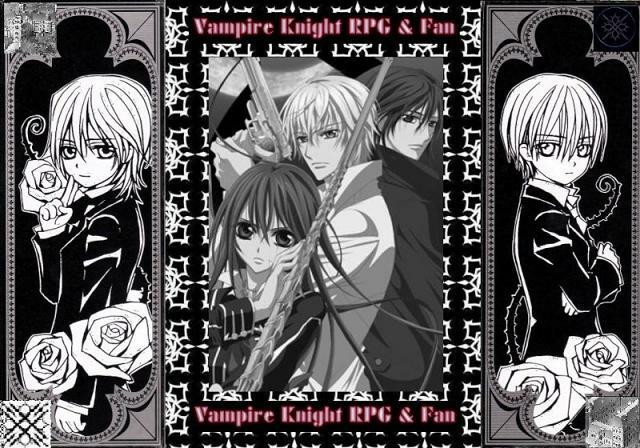 Please provide an RP Sample and try to make it related to Vampire Knight. Most human characters should be unaware of the fact that vampires exist. If your character was turned into a vampire, they are no longer considered human. They are Level D vampires that will eventually become a Level E Vampire. Guardians, class presidents, dorm presidents are all elected and choosen by memebers in OCC. Unless if someone of one of the three goes inactive then an admin will choose the next person. As a vampire hunter you should know that vampires exist (if not then... well you really can't be a vampire hunter, can you?). Keep in mind that you should refrain from having a twin that is still alive as twin hunters are rare. If you are a Level D vampire working for the Vampire Hunter's Association [VHA], keep in mind that you are still a vampire and still have blood cravings, and that you have a tattoo somewhere on your body that is typically located near the area you were bit. And because of that tattoo, you are linked to one other person that has the jewelry that goes with your tattoo and can paralyze you by having your tattoo and the jewelry come into contact. Keep in mind that if you are a vampire and intend to look like a teenager, your actual age should be around that of a century or else you should look more like a kid. Vampires age differently, remember. Once 7 Pureblood Families have been created, and you wish to have a pureblood vampire, you'll need to ask one of the seven users if you can be from their family. This is because there is supposed to be a small handful of pureblood vampires. Please note that there are already 3 Pureblood Families revealed and as such there may only be 4 more additional Pureblood Families. Please remember that if you are not a pureblood vampire you can be subject to a Pureblood influencing you. And if you are a Pureblood, you can't influence other vampires to the point that they'll kill themselves or put themselves in lethal situations. And for those vampires who used to be human, remember that you can easily be controlled by your creator and are unable to kill them; you aren't as sensitive to sunlight like regular vampires; if you are caught by a Vampire Hunter you will more than likely become "tamed"; and that you will eventually become a Level E vampire at some point, having an extreme, uncontrollable blood lust unless your creator gives you some of their blood to drink. Level C and below vampires should not have many powers or very powerful ones since the only vampires that really have powers are Level B and Level A vampires. Vampire Hunters have the power to sense vampires, slightly accelerated healing and can perform some magic spells. Keep in minde that these spells should not be very powerful or drastic as you are still human or were once human. You can not start off very powerful powers unless you are a Level A vampire, or a powerful Level B vampire. And whether or not you're a Level C or Level A, you can only start off with three or four powers. You can get more powers or make your powers stronger as you RP. You can do so in Missions. Keep in mind that regular human students wouldn't typically have a weapon. The only ones who really have weapons are the vampire hunters and vampires. Level E, D, and C vampires can all have weapons; however, Level B and Level A vampires should not have many weapons or powerful ones since they have their own special powers to use. Go here and read info about speices and weapons and stuff BEFORE creating a character. Q: Where and how do I post up my character, powers, and weapons? A: In the Creation Section by clicking on "New Topic" located on the upper left. Q: Do I put my character, powers, and weapons in one post or topic? A: No. Your character is separate from your powers and weapons. Your character should be one topic, your powers and weapons in another topic. Q: Can I only have powers or weapons that appear in the manga or anime? A: No. You can create your own personal powers or weapons as long as they are not too OP or they are not too insane. A: You can have up to two characters, but its best if you only have one character when you start. And if you're going to make Purebloods, try not to create two new Pureblood families so that other people can get a chance to have a Pureblood of their own if they want. Q: How many powers can I have? A: You can have as many as you like, but you need to keep it reasonable so having a hundred powers will likely be a no. Try to only have around ten at the most. Q: How many weapons can I have? A: You can generally have as many as you like, but again, you need to keep it reasonable. Try to only have two or three at most. Q: No one's looked at my stuff for the past few days, what do I do? A: First off, check to make sure you don't have "WIP" or "NF" in the title. You might have just forgotten to change that when you got done making your character. Secondly, bump it. Don't go around asking the staff to check your stuff and approve it.